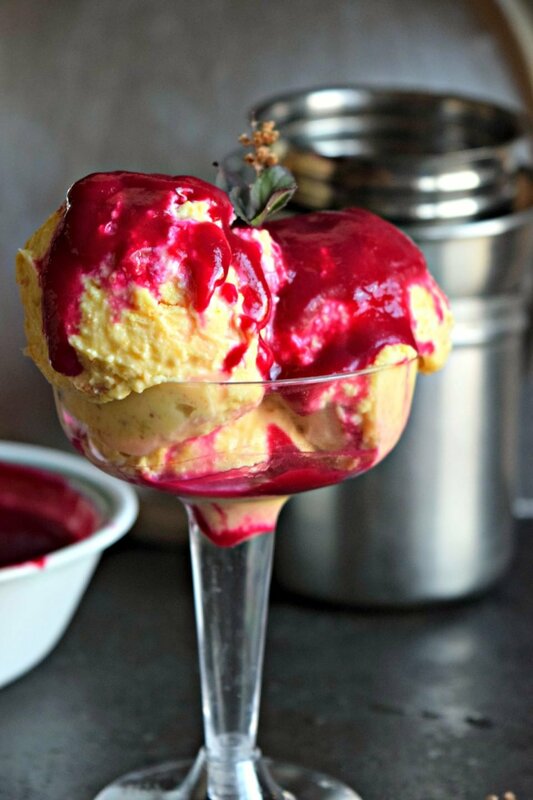 Rabri Ice Cream with Beetroot & Raspberry Sauce is a fusion Indian dessert. A rich pudding made with bread & milk served with this delicious beets sauce. This is an instant Rabri recipe that uses bread to thicken the rabri almost instantly. It reduces the time and energy we spend laboriously stirring the milk till it thickens. Typically, rabri is prepared on low flame, simmered till it thickens and it all comes together. While it is usually served warm, I wanted to give it a different treatment and create a fusion dish here. Serving it as an Ice Cream was the first thought I had and so I decided to go ahead with it. When I was conceptualizing my dish, I felt that serving rabri ice cream without any sauce would make it look plain Jane. Using the regular chocolate sauce was an easy option which I was not willing to take. I wanted to make a new sauce to go with it. I am a huge fan of the Masterchef series. I enjoy watching the Australia and India seasons. Personally it every episode teaches me something new. The show is extremely inspiring and motivating for me. Currently I am following the Indian season and the trend there is to use vegetables to make desserts and fruits to make savory dishes. I think that is such a fantastic idea! I had been toying with this thought for a long time, but looking at the contestants on this show come up with such interesting variations using fruits and veggies, there was nothing holding me back now. I wanted to try this out for myself and see how it tastes. Beetroot has been a constant in my kitchen and have used it to make many savory dishes. Never have I used it to make desserts! and then you can use this sauce on any dessert. 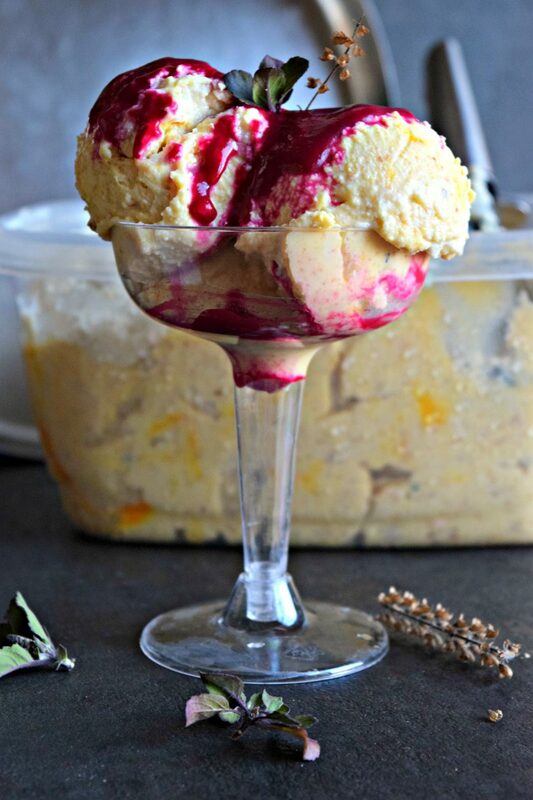 Rabri Ice Cream with Beetroot & Raspberry Sauce is ready when you add a dollop or two in a serving glass and pour some chilled Beets and Raspberry sauce on top. Garnish with some chopped dry fruits and serve chilled. A tip here, keep the serving glasses in the fridge before you actually use them. This helps create the mood for enjoying a frozen delight! 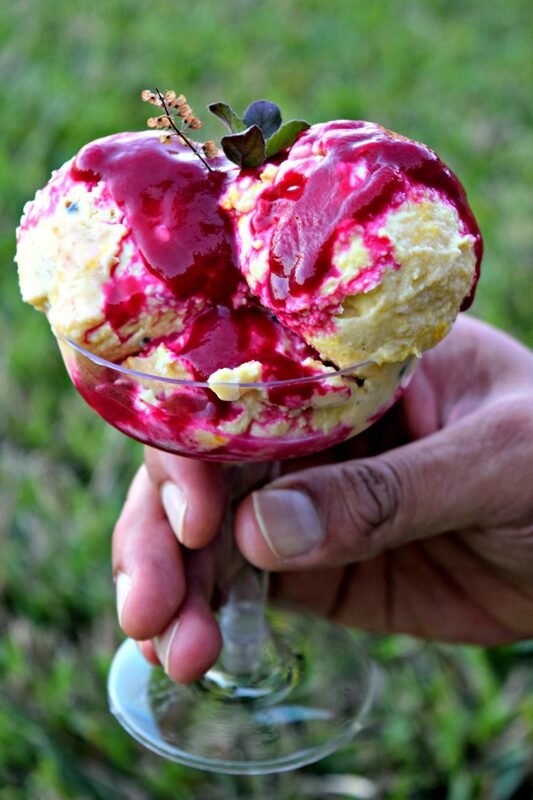 I have even served this to kids and watched them relish this ice cream to the fullest. Their moms have told me that this seems to be a great way to make the kids enjoy Indian desserts, because who doesn’t like Ice Cream! Rabri is served on all festive days and joyous occasions. 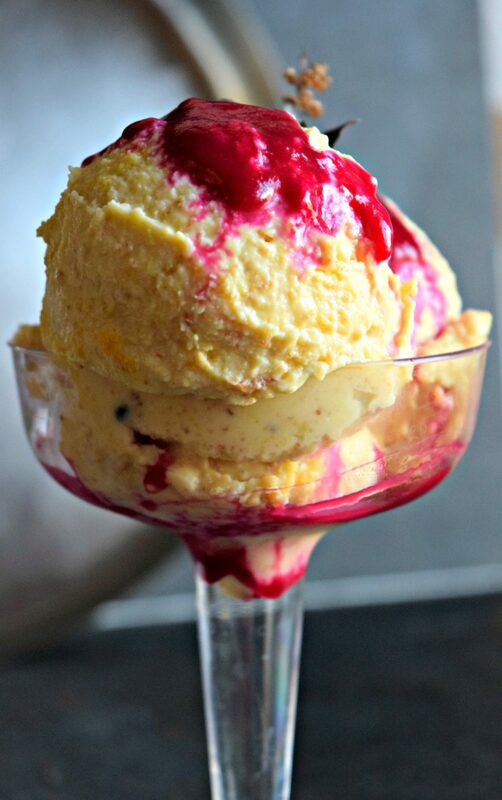 Its deliciously creamy and heavenly to taste. The hint of cardamom and saffron bring in a certain flavor to the dish. I prefer this instant recipes over the other ones because, let’s admit it, we all are pressed for time and always in search of easy and quick dessert recipes. Begin to boil milk in a thick bottomed pan on a medium flame. Once you notice that the milk is beginning to boil, add the crumbled khoya and stir continuously. Once the khoya melts, gradually add the bread crumbs. Keep stirring continuously. The milk mixture will start to thicken. Now add sugar and keep stirring till it dissolves. Add saffron soaked in little milk to the pan and mix it. By now the milk mixture would be thick and creamy. Add crushed cardamom/elaichi and mix. Take it off the flame. If you wish to serve it warm, this is the time to do so. Sprinkle dry fruits on top as garnish and serve. 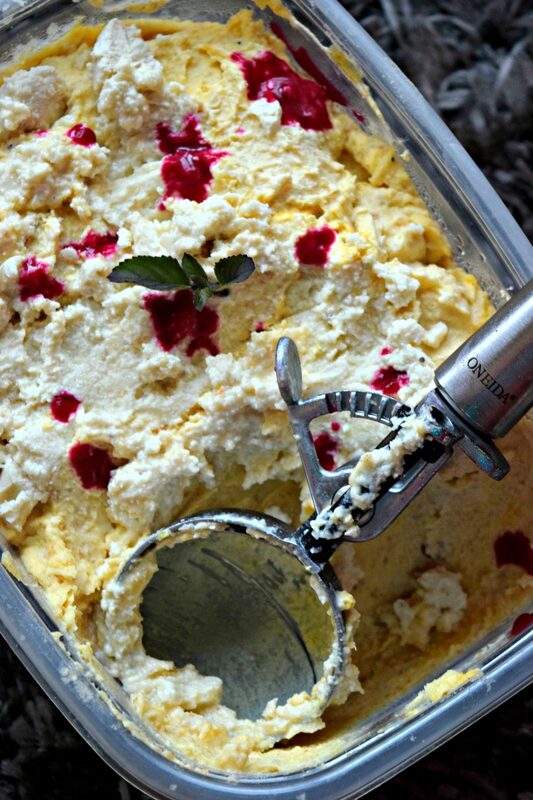 To make it an ice cream, pour this mixture into a container and freeze it for at-least 5 hours. Now it's time to make the Beetroot and Raspberry Sauce. In a pan add raspberries, boiled, peeled and chopped beetroot and honey. Keep stirring till they are soft and mushy. Let it cool down and then grind it to a smooth paste by adding little water. Pass it through a sieve and then you can use this sauce on any dessert. Adjust bread crumbs as you need. While we are still on the subject of interesting and delicious desserts, you must also check out these recipes. 2-Ingredient Coconut Macaroons, Quaker® Simply Granola Oats, Honey,Almonds & Rice Pudding/Kheer, Cashew & Condensed Milk Biscuits, Eggless Almond Butter Oats Cookies and Mango Semolina Cupcakes to name a few. Is it essential to add breadcrumbs? What is it purpose? Yes, it helps to thicken the rabri instantly. I’m new here and curious about khoya. Can you share with us what it is, and the best way to obtain it or make it.